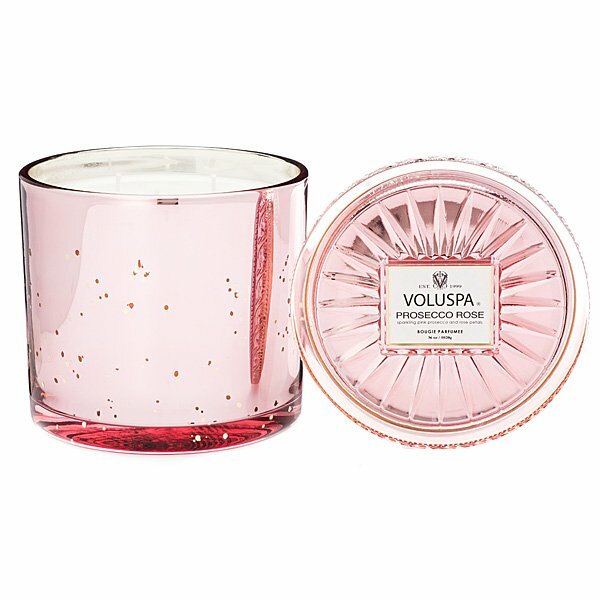 Voluspa Prosecco Rose Grande Candle is the scent of sparkling pink prosecco chilled and poured over ice and edible white rose petals. Formerly Champagne Rose. The Voluspa Vermeil Grande Candle is a decadent 36 ounces of highly fragrant Voluspa proprietary coconut wax blend with a triple wick configuration. Complete with embossed lid, this elegant container gets a second life when used for flowers or trinkets when candle is gone. Made with no phthalates, parabens, sulfates and are not tested on animals.